Southwind's 2006 program titled ""Duality""
From the Southwind Web site: Southwind is pleased to announce its 2006 program titled "Duality." Webster's New World dictionary defines "duality" as a situation or nature that has two states or parts that are complementary or opposed to each other. Through the course of the show, Southwind will be exploring various levels of duality such as white vs. black, brass vs. percussion, classical vs. contemporary, side vs. side, front vs. back and flags vs. weapons, to name a few. Music source material is drawn from pieces by Stravinsky, Holsinger, Andrew Lloyd Webber, Debussy, Bernstein and Shostakovich, among others. Effects will be enhanced with a new uniform look. The high brass will wear a black and white jacket with white pants, and the low brass and percussion sections will wear a black and white jacket with black pants. Read more about "Duality" on www.southwind.org. 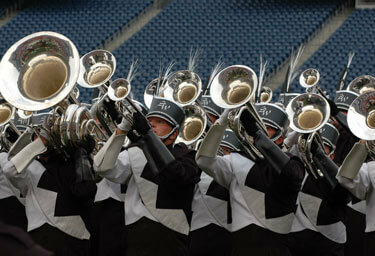 Southwind at the 2005 DCI World Championships in Foxboro, Mass.